We can't take him anywhere, without someone having to hold him or asking: what is it? Some ask: is that a cat? Or is that a bear? Or is that a guinea pig? 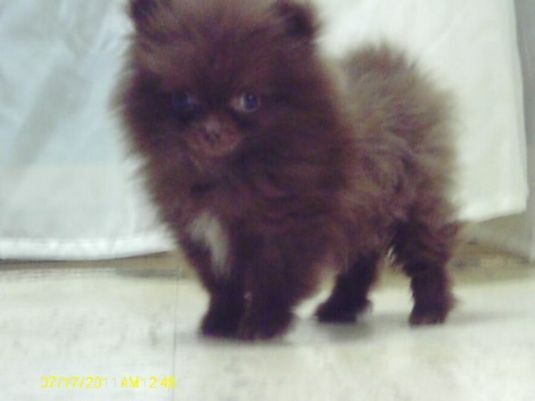 He is a pure blood chocolate brown Pomeranian. He is 3 months old and weighs almost 1 lb. Very playful, happy little guy. Has quite the attitude! He will weigh about 2.5 lbs. when fully grown. He’s already the Little Man of the house & our hearts. 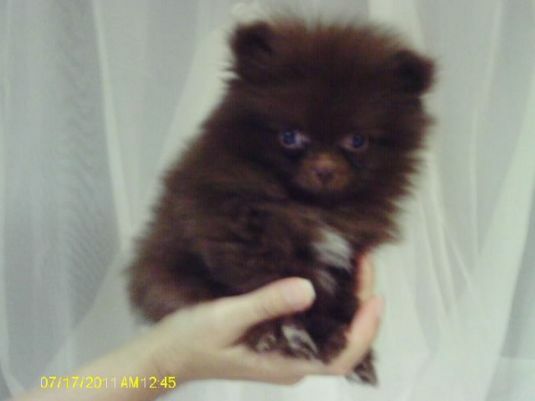 i saw a dog on the talk show he was the cuties little pup i ever seen.i been looking all over for him.he look like a little bear.these dogs are so breath taking .just look like they will jump in my arms.so lovable just to look at them .beauitful couldnt be any better.love. this is my first time here .i stoped here to look at the pups an the larger dogs .they are so real just to look at them.some look to be soquit . some look like they will tear you up thoes are the goodones .soperious i dont have words to say.wonderful. kiss kiss love i will be back soon. Where did you get him? Can I have the information for the breeder that you got him from?